Wellfie Wednesday Tip #98: Enjoy the Benefits of Red Wine! Happy Wellfie Wednesday! And welcome back! This week is brought to you by Diana (@DianaKlatt)! Why does that sound familiar? Because a while back it was the trending anti-aging and acne fighting agent in face creams... But that's not all it does! Resveratrol (3,4',5-trihydroxystilbene) is a natural phenol, a polyphenol to be exact, and it acts as an antioxidant. Studies have shown that consumption of resveratrol can have anti-aging(2) and anti-cancer effects(3), protect mental and cognitive degradation(4), prevent obesity and diabetes(5), and protect against cardiovascular health issues(6). Antioxidants literally reduce oxidation through preventing free radical chain reactions from occurring. The reason that antioxidants are considered to be such a powerful and rejuvenating superfood is for this specific function. During the metabolism of sugars, fatty acids, and amino acids (oxidation) an unstable by-product is created, free radicals, and they are potentially harmful if they are overly abundant in the body. Free radicals are unstable because they have unpaired electrons and they float around in search of a way to fix their instability by latching on to a n y t h i n g ... even DNA. Essentially free radicals are incomplete and they spread their toxicity if they are not stabilized. Antioxidants have electrons to give away! They're extremely generous in nature and are the perfect donor to help out these free radicals and thus humans have come to desire all things antioxidant to help reduce the negative, damaging, and aging effects of free radicals in the body. Sooooo, then why was it in face cream? What the heck does this have to do with your skin? Like I said earlier, free radicals can attach to any proteins, such as collagen, elastin fibers, and lipids which are major for the structural integrity and defensive barriers of the skin. When these break down and are attacked you end up with wrinkles and dryness... and this is frequently caused by excessive UV exposure. So let's get back to resveratrol. Where do we get it and how should we consume it? 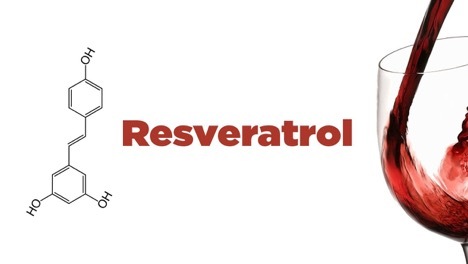 Resveratrol has been showing up more and more on the pharmacy shelves but that's not really the best way to get the nutrients into our system (it does work for some supplements but not that well for resveratrol). Consuming natural sources of resveratrol helps to actually get it into the system and working it's polyphenol, antioxidant magic. And what better way than to drink it in a glass of red wine? Don't drink? No worries, resveratrol can also be found in blueberries, cranberries, and peanuts! Disclaimer: Please drink in moderation, the suggested portion is 1 glass for women and 2 glasses for men. Studies have been relatively inconclusive of the overall health benefits of wine consumption for resveratrol intake and efficacy. 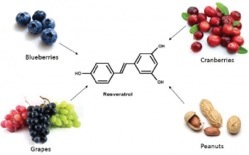 Resveratrol was discovered and recognized as an antioxidant in 1992 and is relatively new comparatively to other well known and studies sources of antioxidants. Diana's piece originally appearing at www.klattalyst.com/resveratrol. Thanks again for all of the #WellfieWednesday support, be sure to post your pictures this week and tag the WW crew members in your post (@TheFuelPhysio, @Eric_in_AmERICa, @AaronPerezPT, @DianaKlatt) and keep the wave of healthy change going! 2. Semba RD, et al. (2014) Resveratrol levels and all-cause mortality in older community-dwelling adults. JAMA Intern Med. 174(7):1077-84. 3. Tan L et al. (2016) Resveratrol inhibits ovarian tumor growth in an in vivo mouse model. Cancer. 122(5):722-9. 5. Koppes LLJ et al. (2005) Moderate Alcohol Consumption Lowers the Risk of Type 2 Diabetes. Diabetes Care. 28(3):719-25. 6. Liu Y et al. (2015) Effect of resveratrol on blood pressure: a meta-analysis of randomized controlled trials. Clin Nutr. 34(1):27-34.